Ararat Rural City Council has agreed to support a funding application to the Australia Government to upgrade the Bill Waterston Skate Park at Tuesday night’s Ordinary Meeting. Ararat Rural City Council staff have worked closely with passionate community members since it assumed full management responsibilities for the skate park in late 2016. The partnership has seen plans developed to extend the skate park on the eastern side towards Queen Street, as well as works to tie the precinct in with Alexandra Gardens. Ararat Rural City Council Mayor, Cr Paul Hooper said the project was another example of Council working side-by-side with the community to improve the municipality’s assets. “As the managers of the park, it is important that Council drives this grant application with the support of the Skate Park Committee,” he said. “It has been fantastic to hear that both Council and community members, which have included valuable input from our city’s youth, have worked so productively together to get to this stage of the process. If successful with the Building Better Regions Fund grant application, the project will have contribution from the Australian Government, Ararat Rural City Council and community, including a substantial contribution from Ararat Community Enterprise. “The enhancements would cater for all users, from novice through to those looking to pursue the sport at a higher level,” Cr Hooper said. 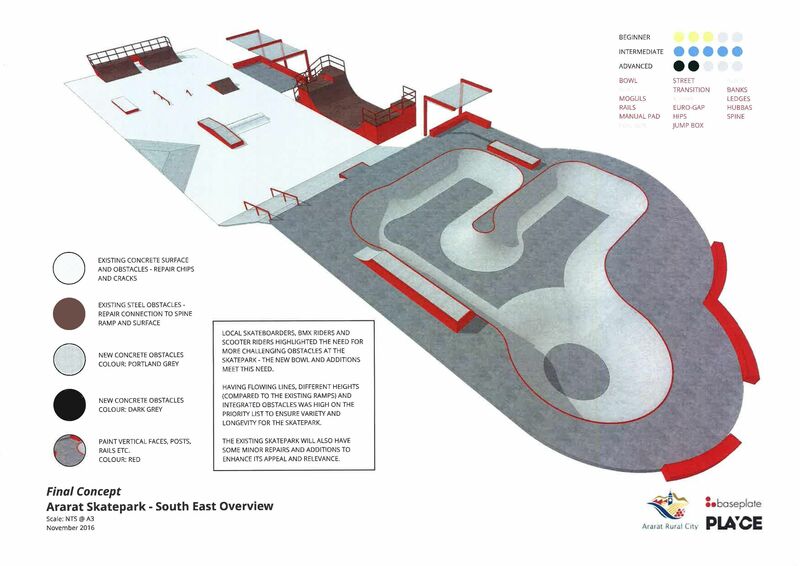 Councillor's will also consider the Ararat Skate Park project in Council’s priority project listing, which is being currently being worked on inconjunction with the Council Plan 2017-2021.